StateTrust Investments Inc. is a brokerage firm that, operates as a subsidiary of the StateTrust Group, a wealth management and holding company based in Miami, Florida, that has a wide network of affiliates and offices all over the world, including a life and annuities firm (British Virgin Islands). Throughout its global investment platform, StateTrust Investments seeks to help clients grow, manage, and protect their financial assets. The firm’s financial advisors ensure that clients receive an investment strategy that is personalized according to their financial goals. StateTrust Investments is regulated and supervised by both the Financial Industry Regulatory Authority (FINRA) and the Securities Exchange Commission (SEC). To protect client assets, the firm is a registered member of the Securities Investor Protection Corporation (SIPC), which protects its member’s clients in amounts up to $ 500,000.00, $250,000.00 in cash and $ 250,000.00 in securities. More information available at www.SIPC.org In addition to the SIPC coverage, StateTrust Investments, through Loyds of London and other insurance companies, provides coverage of a maximum per client loss limit of $ 24.5 million with a maximum of $ 25 million for the clearing firm. 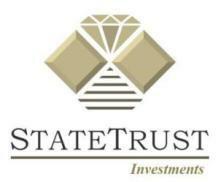 Securities offered through StateTrust Investments, Inc. Member of SIPC/FINRA. SIPC protection offered only on accounts held at StateTrust Investments, Inc. Investors should carefully review the objectives, risks, charges and expenses of any investment company before investing. The information presented on this communication is not intended to provide legal, tax, insurance or investment advice or to be universal. It is not a substitute for professional advice.